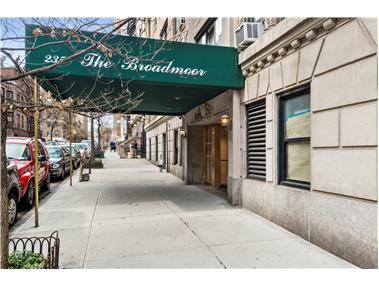 This beautifully renovated 1BR apartment at the Broadmoor faces south and gets great light. The kitchen has white cabinets & appliances including a dishwasher. The 'K' line has one of the largest living rooms with space for both entertaining and dining. The bedroom has a wall to wall closet with a renovated en suite bathroom. The apartment features beautiful inlaid oak floors, beamed ceilings, and pre-war detail throughout. It has just been painted and is in mint move in condition. The Broadmoor is a pre-war full service building with 24 hour concierge/doorman, live-in superintendent, a bike room, a laundry room in the basement, and a beautiful outdoor roof deck and glass-enclosed solarium with wireless internet access and sweeping views of the city and river. Close to all public transportation, Riverside Park, Central Park, and many great restaurants and shops, such as Cafe du Soleil, Silver Moon Bakery, and Whole Foods.